we had to pack our bags this morning and wrap up the instrument. It was hot, we'd accumulated some heavy goods over the last couple of weeks, we had trouble getting a taxi, and we were already late. This did not stop Anders from making a last visit to the post office for mailing his last post cards. After passing some heavy traffic (using the road shoulder and the empty yet restricted olympic lane creatively), we arrived just in time at the airport and avoided the all too familiar loudspeaker message: Can Mr Eggum and Mrs Melby please go to gate, you are delaying the flight! We spent a couple of hours in downtown Amsterdam, and was picked up by Olav at Oslo airport around 11 pm. It's way past midnight now, we've eaten a sleeping pill each, and Astrid is already in dream land. Thanks for following us! we actually managed to keep our schedule. First, we biked to the post office to buy cardboard and had breakfast. After returning the bikes to the apartment, we took a cab to the Summer Palace. Our schedule for the rest of the day was as follows (and we are no earlybirds): Visit the Forbidden city, shop silk at the Clothing Market (we actually bought quite a few souvenirs and had to make another stop at home to unload), bike to the station, take the train closer to downtown and walk to the music instrument store - we lost our way, and reached the store at about 9 pm. We (or 360 yuans for two flutes, 40 for a lesson, and 30 for taxi) convinced them to stay open for a while longer so that Astrid got her guzhong (?)lesson . The guy was very talented. He played almost all of the instruments they had, and if did it well. Great! Dinner at last. Two drunk chicks tried to pick up Anders,convincing him that they were all out of money and really drunk. Tough luck! We took a taxi to our bikes, biked home (but stopped by the friendly neighbourhood kiosk) and fell fast asleep. There are at least 9 million bicycles in Beijing, and they all have different sounds. The bell seems to mean "I'm here", the more radiant "watch out", or simply "move!". You can load anything on your bike, cardboard (several square metres of it), garbage, fruit, your fridge, your wife, your wife and family... My bike is pink and has one bell. I try not to look behind me, and the crowd of people in front of me seems to know what they are doing. Anders has got two bells on his orange bike (of course included in the bargain price). Our bikes are the ONLY bikes with color. All other bikes are grey or black or something in between. Around where we live, Chinese people seem to live as well (live, work... I am not sure about the difference, and that is not entirely in a bad way) each in their own store. It turns out that some of them speak English, for instance the son of our friend at the store next to the bike store. Closer to the Summer Palace, which is where we went this afternoon, the side of the roads are all covered with cardboard woods and olympic pennants. We stopped at a restaurant where you boil your own food in soup. They had to bring us the menu "in flesh" to be able to take our order, and cook various food for us to show us how to prepare it. Tomorrow will be a busy day, the number one and two priorities being going back to the music store and getting hold of cardboard to wrap what we bought at our last visit there. After a simple Chinese breakfast on 17 Wellington street, we headed over to Kowloon and visited Gary and his wife Annie, who treated us with an outstanding lunch, Cantonese style, in a great restaurant. We also visited the Opal Mine, their jewellery store, which is designed like a mine where you can a lot about opals. Astrid got a beautiful ring there, too. After lunch, we did some shopping at Ladies market, and walked down Nathan road to Kowloon pier, where we saw the whole 8 pm lightshow. Again. :-) We marked the end of our stay in Hong Kong with a visit to a jazz club in Soho. The live band was lousy, but we were the only guests that monday night. We had a good time, though! Anders took boat, train, and bus as far away from the city as possible, while Astrid explored the streets South of Hollywood road, including antique markets, art galleries, temple, and other treats. 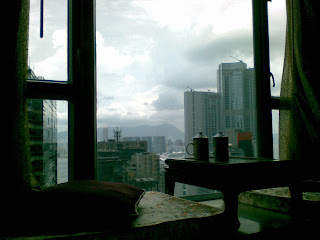 Astrid: Had morning tea in the window of our room on the 24th floor, looking at the boats crossing over from Central to Kowloon. Walked around the neighbourhood (Soho), went to oldest temple in HK, visited contemporary art galleries and the antique market in Hollywood Road. After meeting up, having pizza, and relaxing a little bit, we took the ferry to Kowloon to see the 8 pm lightshow on the skyscrapers on Hong Kong from a distance. We arrived in Shenzhen this morning, and entered Hong Kong through immigration a few minutes later. This is the cleanest city we've visited so far. Prices are high, almost the same as in Norway for food and hotel. We'll be staying here for three nights before returning to Beijing. Astrid writes: For 2 days, we have seen only 1 white person - an American - except each other. My eyes are amazingly blue all of a sudden, and we are the tallest people on the planet. 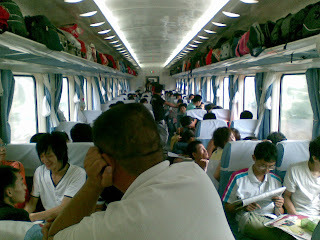 Today we arrived in Wuchang/Wuhan by train. I slept all night, but Anders had some trouble sleeping - partly due to bad dreams about Chinese characters (which we enjoy) and partly due to increasingly stomach problems. Wuhan is a city of about 12 million people in the mid south (still the only white people). The city is located om the Yangtze river. Upon arrival, we were met by a huge construction site, forcing us to walk for at least 20 minutes around the train station (entrance on one side - way out on the other!) in 35 degrees C and extreme humidity. The ticket office was on the front side of the building, outside, of course. We bought tickets for Shenzhen for the same night, and checked in to the closest hotel to take a day off. (RMB 85). After sleeping for a couple of hours, we headed downtown to get something to eat. We took a cab to Snack Street, a street filled with snack bars and hole-in-the-wall restaurants. Actually, the entire city (at least the part we saw) consists of hole-in-the-wall places, offering chili, foodish stuff, pots and pans, and everything else that anyone could possibly buy. We did not go to the city centre, though. We seem to have gotten a two-bed coupe for tonight, which we are very happy about. Today, we actually managed to buy the tickets we wanted, without any English (not entirely true, since a helpful woman in the line did assist us a little bit). Chinese people are extremely kind, helping us getting cabs and being very understanding about our general level of confusion. Taxi drivers, however, are not particularily fond of foreigners... Many refuse to take us. 9th wonder of the world? Yesterday, we didn't really know what kind of tickets we had and when we were going exactly (besides the direction), but we managed to upgrade our seat tickets to beds aboard the train. 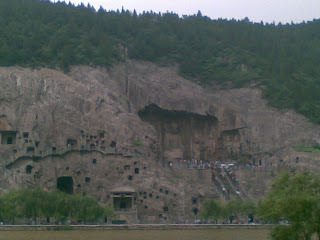 more to come on the 9th wonder: Longmen caves. We got up early, skipped breakfast and took a taxi from the hostel in Xian centre to the train station right outside the city wall. We had no problems boarding, and met a nice, English speaking chef onboard. He was going to some nearby mountains to hike. He asked some other travel companions to tell us when to get off, which they did about 5 hours later. Luongyang did not seem like a small city at all to us. Many tall buildings were spread out across a vast area, with lots of wide, long roads. We had to bargain for a cab - with a middleman - who kind of lost. The fare to the caves was just 4 yuan more than the meter said. Total 35! We walked to the grottoes, a myriad of Buddha statues in sizes ranging from dwarf to giant carved into the side of the mountain. We also visited a temple on the other side of the river. Returning to the station were we bought new train tickets, Astrid encountered a real public toilet - meaning a hole in the floor, no door, and the next needy within the same three walls before the pants were back on! Our train ticket would take us somewhere, hopefully in the right direction, seating standard unknown for 150 yuan. We later found out that the city was Wuchang, about 10 hours away, and we could upgrade our tickets onboard to beds for only 150 yuan. What a stroke of luck! We went on a guided tour to the excavation site of the Terracotta Warriors today. It was quite a sight. Nearby, there is a huge grave, where emperor Qin lies burried. The grave is actually a hill built by humans, with more than 2000 years worth of natural landskaping on it. On the way, we were told that the city walls of Xian are about 30 kilometers long, and you can bicycle on it - the roundtrip takes about 100 minutes. On the way to the main attraction, we visited Bampo village, a 6000 years old excavation site where foundations, mugs, and remains of the villagers where exhibited. We also visited a factory where they make terracotta stuff (such as souvenir warriors) and a silk factory where we could see how silk is prepared from the silk worm cocoon to finished goods. Still at Starbucks... Staying in a twin room at a nice hostel with a view to the Bell Tower in the centre of Xian. They speak English fluently, and are very helpful and service minded. We almost got tickets to Tibet, too - including flights in and out, hotel, and guides - agreed on a schedule and went to the bank to unload about $3000 in cash, only to come back and be told that the rules had changed at the Tibet office: Papers must be sent by mail, not fax anymore. That added a few more days which we don't have, so we'll still have to go somewhere else. Oh well. Coffee break is over! Off to the terracotta warriors! Xian, an earlier Chinese capital now famous for the army of terracotta warriors, was the start and end of the silk road to the West. The city centre is surrounded by the still intact city walls, with the drum and bell towers in the middle. Looking back on Tuesday, we really liked the muslim quarter, thriving with life day and night. There were great shows in both the Drum and Bell towers (I liked the drums best). We took an electric rickshaw to the train station (no taxis want to give us a ride here - we have no idea why) and bought train tickets. The station is the noisiest place... All of the ticket counters use microphones/loudspeakers turned to max, and they don't exactly whisper! We waited in line twice, and got tickets to Luoyang for Thursday morning. It cost abot 10 USD for a three-hour train ride, but we must stand all the way (restaurant wagon here we come). After eating some hot donkey for lunch, we went to a local travel agent and bought tickets for a flight to Xian for the next morning. The price was alright, until they added their fees to the total. Fine. Then, we requested the total price of tickets from Xian to Hong Kong. The guy asked who the tickets was for (!!) and gave us a price of 2400 Yuan, which was OK for the both of us. When he booked the tickets, though, it turned out that this was the price for one person, so he claimed that we owed him 4800 RMB (same currency, just a different name). We didn't want those tickets, but they had been booked, and I didn't even want to pay for cancelling tickets I hadn't ordered, and the fight had started. After about an hour, and both me and the agent threatening with police, Astrid pushed for just paying the 100 Yuan fee (about $16) and get going, which we did, and then everyone was friends and none of us had actually called the police, and it was all a big misunderstanding. Smile! Finally, we checked out the Chinese Hooters, Anders had his hot breaded chicken wings, and then we could go shopping. On the way home, the weather got a little more nasty, so I biked home in shorts and socks. honey melon and mango on the side at home. tipping. Got a lesson on taxi fares. Brought fruit which we bought on the street last night. cliff James Bond style: by wire. Left camera in cab, driver called. Remember receipt! and a calm wind was brushing through the city. Later on, we took a "private"
store, who met the day before for a chat, we went home. seat belts - you're lucky if you find a cab that has them. one of the three lakes nearby the Lama temple. in Beijing 10 hours later, on Friday morning.